Traralgon flourished after the opening of the rail line from Melbourne in 1877. Sawmills and dairying were the underpinning of the local economy, and an elegant post office and court house were constructed in the 1880s. Australian Paper Manufacturers set up a mill, north-west of Traralgon in the late 1930s, by which time nearby Yallourn had been built from scratch to house workers for electricity production, based on the huge deposits of brown coal in the area. The privatisation of power generation saw decline in nearby Morwell and Moe, with Traralgon emerging as the dominant centre of the Latrobe Valley. The city of Traralgon is located 160 km east of Melbourne, on the main road and rail route through Gippsland. Traralgon Creek flows through the city, joining the Latrobe River several kilometres to the north. The explorer Strzelecki passed through this district in 1840. His journey is commemorated by a cairn east of the town. Edward Hobson occupied the Traralgon pastoral run from 1844. 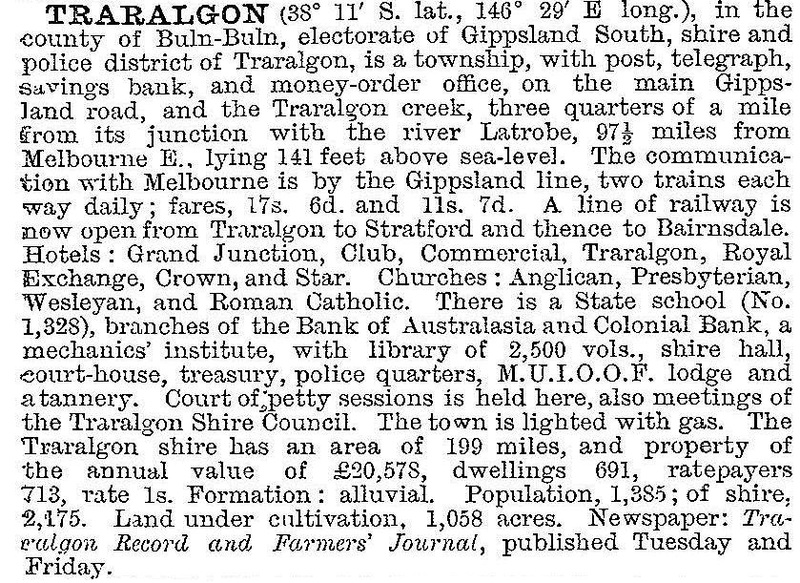 The name Traralgon is thought to be a composite of Aboriginal words meaning river of little fishes, but linguistic analysis casts doubt on this. Sheep were grazed on the extensive plains along the river, while forest covered the rest of the country. A township was surveyed in 1859 but by 1861 there were still only a few buildings. A hotel catered to drovers and travellers and to miners bound for goldfields in the Great Dividing Range to the north. From the 1870s selectors took up land on the pastoral runs, spreading south into the Strzelecki Ranges. The town did not grow much, however, until the opening of the railway line from Melbourne in 1877. A number of sawmills were soon established, utilising the red gum timber for railway construction, local building and for sale in Melbourne. Access to markets for produce encouraged dairying, especially as more land was cleared. 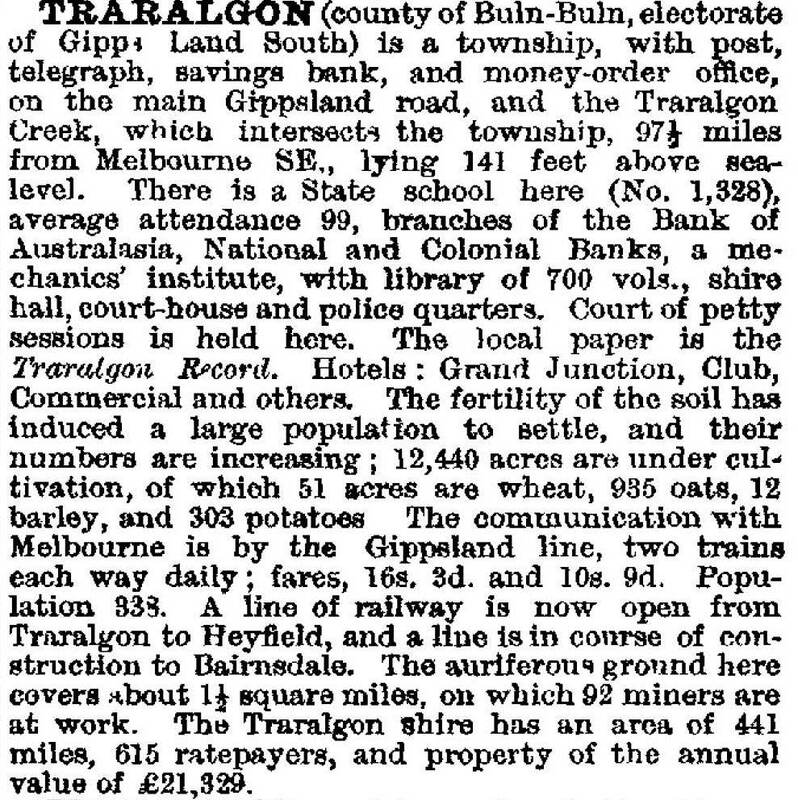 The Traralgon shire was proclaimed in 1879. Further subdivision of land in the district assisted dairy farming. A butter factory was established in 1892. A tannery and bacon factory operated from the 1880s, as well as cattle saleyards. There had been agitation for a rail link between Traralgon and South Gippsland. This never eventuated, but in 1903 the repair depot for the Gippsland line was moved to Traralgon, bringing many railway workers to the town. In the 1920s the town of Yallourn was built, west of Traralgon, to house workers for the developing power generation industry. Until a shopping centre was provided at Yallourn, Traralgon businesses benefitted from the increased patronage. Nonetheless, in the 1930s, the town was still basically a rural service town with two State primary schools, a higher elementary school, a Catholic school, banks, hotels, the weekly Traralgon Record newspaper, a showground, a race course and a livestock saleyard. This provincial atmosphere disappeared when Australian Paper Manufacturers established a paper pulp mill at Maryvale, on the Latrobe River north-west of Traralgon. A pilot mill was established in 1936, and by 1939 the main mill was in operation. New homes to house the large labour force were constructed by APM and the Housing Commission. Other industrial operations soon followed. These included La Mode Industries which set up a factory in 1944. Cement and cement products were produced from 1950. The butter factory was taken over by a larger company, which in 1963 constructed a milk bottling plant. The Central Gippsland (Base) Hospital opened in 1956, and education boomed: a high school (1951), a technical school (1960) and three State primary schools at Stockdale, Kosciusko and Liddiard Streets (1950, 1953, 1960). In the late 1970s work commenced on a new power station at Loy Yang, south Traralgon, and in the 1990s the Australian Securities Commission established its national information processing centre at Traralgon. Traralgon was less affected in the 1990s by the privatisation of the power generation industry than nearby Morwell and Moe. It has emerged as the regional centre of Latrobe Valley, being the location of many government authorities and regional medical services. The city is well served educationally by preschools, primary schools, State and Catholic secondary schools and a campus of Central Gippsland TAFE College. There is a Performing Arts Centre and numerous sporting facilities, including a racing complex and the Traralgon Tennis Centre. Nearby is an all weather airport with interstate flights. The industrialisation of Traralgon in the 1950s inspired the urban residents to agitate for separation from the shire council. In 1954 the town held 88% of shire’s population. Separation came in 1961 when Traralgon borough was proclaimed, followed in 1964 by upgrading to city status. Two notable Australians with Traralgon connections are Sir Macfarlane Burnett, a Nobel prize winning scientist who was born in Traralgon and Mary Grant Bruce, well known writer, who spent some of her life in the town.